If you thought The Flash was a busy guy, then you haven’t met Andrew Kreisberg. Kreisberg, who executive produces The Flash as show runner, moves as quickly as the fastest man alive by establishing new concepts, characters, and developments for The Flash’s world. And as The Flash’s second season looks to introduce even more exciting features and additions, he doesn’t plan to slow down anytime soon. Fortunately, Kreisberg was able to spare a few minutes during this year’s San Diego Comic Con International to discuss Season Two’s biggest developments. Below, he explains how season two is unique from season one, the returning-and new—villains that will stalk the Flash, and how often The Flash will cross over with his other DC Entertainment show, Arrow. What is like dealing with so many timelines and alternate realities? How will you continue to work with those tropes in season two? When you do anything with time travel, everybody has their theory on how it works. I think what was important for us, more than making logical sense, was it making emotional sense. And as long as you udnerstod what was happening to the characters emotionally, and as long as you understood what the stakes were, I think you don’t have to stop-gap the logic of it too much. We feel like we have our rules. There’s certainly cause and effect. Time is not immutable. Time can be changed. Our entire series takes place in an alternate timeline, from the one that should have existed. Those are the stars we guide ourselves by. What’s going to really separate season two from season one? Now that the multiverse is here, will the structure change at all? I think the kinds of villains we have are very different this year. Last year was about getting the band together in a way, and Barry taking his initial steps into being the Flash. And now this year, it’s like great—we’re doing it now—but what does that mean? The thing we’re really tackling this year is how everyone in Central City knows about the Flash now. He’s becoming public figure, and the notion that denizens of Central City live in a universe where people have superpowers, and evil peel th superpowers, is not outlandish anymore. But by the same token, they know that there’s a savior out there who has powers to fight them back. So we’ll see Barry discover and deal with the fact that he’s famous now, and not just the mysterious Red Streak. Speaking of outlandish ideas, were you afraid that viewers would balk at the name Reverse Flash? Well, that’s one of the great reasons we have Cisco Ramon on the show. Cisco is essentially us, the writers and audience. These guys would not name themselves. But for Cisco to name them—that’s kind of fun. And then when the characters hear Cisco’s name, they embrace the idea and like it. The very successful comic book adaptations have been the ones where the creators said, “You know what? This is is what it is, and we’re going to go for it. Will there be more crossovers with Arrow? We do have more crossovers planned. Both episode eight for Flash and Arrow in Decemeber will be a two-part crossover, like we did last year. That will be the big crossover event, but then, like last year, we’ll have the mini crossovers where just one character will show up. These shows are linked, and if there’s an attack in Central City, we’ll hear about it in Starling City. When we first started, we were afraid that we’d implode by expanding too much. Instead, they seem to lift each other up. How many villains from season one will you bring back? Grodd is definitely coming back. And how many new DC Comics characters will there be in the second season? There will definitely be more rogues. But, we don’t sit down and ask how many characters we can dump into this. It’s more like, what can we do for the characters we have? And when we bring somebody on, we do it with a concern for how they’ll help the other characters grow. 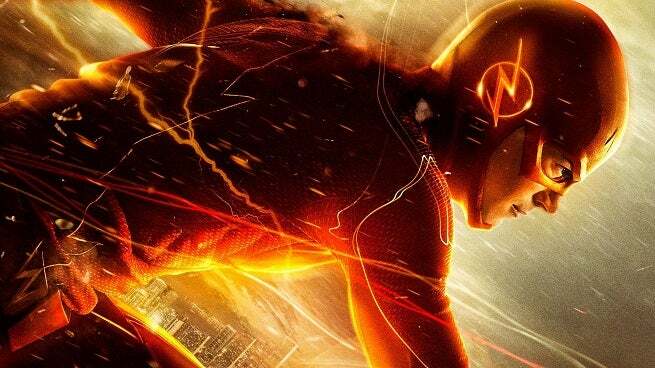 The Flash’s second season premieres on October 6 on The CW. Follow along with ComicBook.com's San Diego Comic Con 2015 coverage by clicking here!